Has anyone tried a fitness hoop? I bought one from walmart a couple of weeks ago and Im not sure how to calculate how many calories burned for a 30 minute session. Hi Beth . I think mostly everyone here is into DVD's and fitbits,running . I have not read anything on blogs about it anyway. Have you looked it up online and maybe there will be something there for it. Good luck. 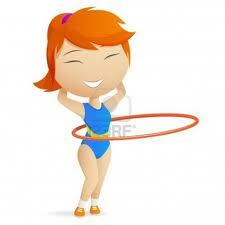 I have a fitness hula hoop, but I have no idea how many calories it burns. I have a bodybugg that I wear to calculate all my calories. You can probably google it online. I've been thinking lately about the various claims out there about how many calories hooping burns - one sees anywhere between 300 and 800 (!?) per hour. The upper echelon of the scale just seems way out-there to me -- and what in the world are they basing it on? Any chance your detective skills and readers can get to the bottom of this for us all? How many calories an individual burns hula hooping will always be relative, but the scientific claim we stand behind is 100 calories in 10 minutes. Some using simple math have thus concluded 60 minutes equals 600 calories. This may be true in theory, and you can burn 600 calories doing many high impact aerobic exercises, but in reality it's unlikely. The initial energy burning spike begins to decrease after ten minutes. Whether you're sweating in an intensive hoop aerobics class or dreamily hoop dancing to Imogen Heap on a sunny day also plays a factor, as does your body weight and the weight of your hoop. That's why giving a range - 300 to 600 calories - is accurate and useful. Thanks for all the info. I think I will go on the low end of the calorie burn for this. I guess the main thing is that I am moving and not sitting and I enjoy doing it. I think I'll try that this weekend. Thanks for the encouragement! Now I want a Hula hoop! I have the 4lb hula hoop at home and my co-worker has a 5lb hula hoop at work. I would recommend the 4lb or less for beginners I have been doing it for a while and I love it I just log it as aerobic activity? I have an exercise hula hoop. It's actually fun and challenging. I've never bothered to figure out the calories ... biggest problem is finding where you can use it because an exercise hoop is bigger than just a regular kids hula hoop and weighted. I've whacked more stuff over down in our basement! Mine gave me bruises on my hips! Just got a 2.5 exercise hoop and I can keep it up. I will keep trying and count it as 9.6 calories burned a minute. The good news is what little I did I can feel in my stomach muscles. Here's a link to the hooping.org that lyn mentions. Showing dancing with a hula hoop.